As BASIS Chandler, located just outside of Phoenix, neared the end of its 2012-13 school year, College Counselor Bob Bowley faced significant challenges. With no central location to track college application data, transcripts sent, letters of recommendation, and test scores, the staff supporting BASIS Chandler’s class of 2014--its first graduating class--was ill-prepared to ensure college application materials were tracked and submitted on time. Elizabeth McConaghy was experiencing similar challenges as the College Counselor at BASIS Scottsdale. She was using paper forms to communicate with parents, keep track of students’ college lists, and collect teacher recommendation information. The slow and cumbersome process was difficult to undertake, especially as a single staff member. Bowley and McConaghy knew they needed a new solution. BASIS Tucson, the first school in the BASIS network, opened in 1998. The network has since grown to 16 campuses in three states, and serves more than 7,500 students in grades K-12. BASIS schools are open-enrollment charter schools that align themselves with internationally competitive schools across the globe. The network has a reputation for rigorous coursework, and prides itself on creating a “culture of academic excellence.” BASIS schools have received various accolades, including top school rankings in US News and World Report, The Washington Post, and Newsweek. Despite their strong reputation, BASIS schools knew they needed a new way to help students develop and take charge of their post-secondary plans. BASIS schools became part of the Naviance Network in the fall of 2013. At one of the first trainings, Bowley sat next to a longtime college counselor from a fellow BASIS school who stated “I feel like we’ve magically moved from the Dark Ages to the 21st century.” This began a system-wide adoption of Naviance and Naviance’s student-facing account, Family Connection, across the network. Career Planning, a feature of Naviance Family Connection, includes an in-depth analysis shows students details of each career, including job duties, schooling needed, and typical salaries for those within the state. By showing students the connection between their strengths and interests and their potential careers, BASIS Chandler staff were able to engage students in more meaningful conversations about their educational and professional futures. Students within the BASIS network are provided with many hands-on career planning opportunities in Naviance such as Career Interest Profiler, Do What You Are®, and the Career Cluster Finder. Combined with career profiles, these tools provide a launching pad to the intensive college prep that BASIS Schools pride themselves on. College readiness is at the heart of BASIS Schools across the country. With a near 100 percent college-going rate, the college planning process can be a large task for college counselors and other staff within the schools. At BASIS Scottsdale, College Counselor (now Head of School) Elizabeth McConaghy changed the workflow of her office as a result of implementing Naviance. While in the past, the college application process took a significant amount of time, she now manages college lists from one central location, sees transcript requests sorted by application deadline, and can track letters of recommendation with the click of a button. 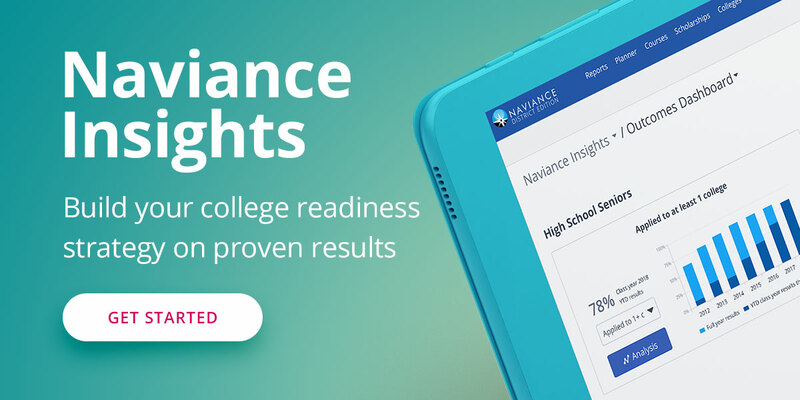 In the past, many students only considered local colleges and universities, but Naviance’s college search tools such as SuperMatch, the college search, and ActiveMatch have allowed them to see the possibilities that colleges outside their locale might offer. Each student in BASIS Schools is given the option to complete a senior project, a large-scale assignment allowing students to showcase the skills they have developed over their time at BASIS. The use of Naviance Success Planner has allowed BASIS schools to assign this senior project to students, track progress, and report on project completion, eliminating the need for manual tracking and communication. No more spreadsheets! College matriculation, teacher letters of recommendation, profile information, transcript requests, and test score reports are all electronically tracked through Naviance. This saves counselors and administrators countless hours that used to be spent adding, subtracting, and tracking student data. Approaching year two with Naviance, BASIS schools are looking to ramp up the features they have already successfully implemented. Plans include adding in course planning features, Gallup StrengthsExplorer, and other college and career planning pieces. In addition, BASIS continues to explore the realm of opportunity that exists within the reporting and communication features of Naviance. Interested in learning more about Naviance? Contact us today!